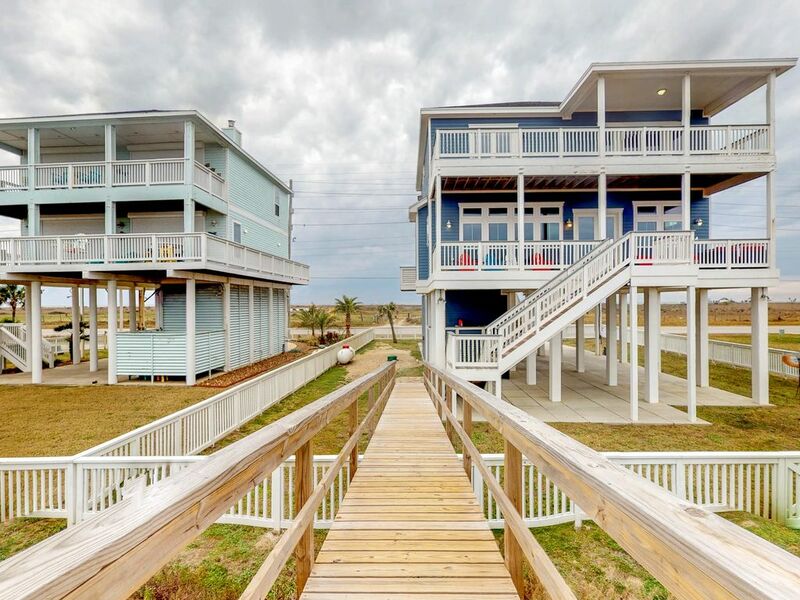 Gaze out over golden sand, crashing waves, and endless blue skies at this four-bedroom Galveston home, an elegant coastal escape with an elevated, multi-level deck, a spectacular Gulf-front position, and a private boardwalk that leads directly to the wide open beach. This refined beachfront home sits on the southwestern shores of Galveston Island, just up the road from the San Luis Pass. Wake up each morning to watch the sunrise over the Gulf of Mexico; spend your days swimming, kayaking, fishing, and boating; and take an evening or two to explore The Strand in downtown Galveston 23 miles northeast. The air-conditioned living space is full of sunlight and majestic Gulf views, creating a stunning space to entertain friends and loved ones. Pull up a stool to lend a hand in the open gourmet kitchen, use the free WiFi to share photos of the morning's sunrise, and flip through the sports section on the partially covered, two-level deck. Take long walks on the beach and return home to play board games by the gas fireplace, sip cocktails on the deck, and choose a Netflix/cable movie to play on one of the five TVs. Experience Galveston in beachfront luxury - book today! Parking Notes: There is no garage parking here. You can park three cars underneath the house, and the rest in the driveway. The local operations manager will monitor noise levels and vehicles to ensure that the no party policy is fully enforced. Water Access: There is a private bridge from the yard for direct access to the beach. Great house. Plenty of room for privacy and together time. Right on the beach but about 20 miles from downtown hotels and restaurants! Loved it. The house is in great shape with more than adequate supplies and provisions. The check in and check out process was a breeze. It was a relaxing and stress free stay and overall a very positive experience. House has direct access to the beach and wonderful views of the beach from the main living space. Very open kitchen, which allows for multiple people to be in the kitchen at the same time. House has 2 bedrooms that have attached bathroom, which is great to have with multiple families staying together. Lovely house with view of the beach and direct beach access. Wonderful roomy kitchen for multiple people to work in. Very open atmosphere in the main living area. Beds are very comfortable. We had a nice time. The house was very nice and the view was great. We had a number of things we were looking for in our search for a beach house since it was my wife's birthday and our 50th wedding anniversary and our rental date was in December. This house had all we were looking for including a gas fireplace, great right. Well when we arrived, my wife wanted me to light the fire place and I discovered that it required a re-mote control which was not to be found anywhere. I called the given number and a very nice person came out to the house and he did all he could to find the re-mote but none could be found. He called the owner and did reach the owner's assistance but she could only say that it was in the house a few days before. There was no backup re-mote therefore we had no fire place and this is why I gave our stay only 4 stars. Small things like this can and do mar an other wise great time.